Our older son, Joe and daughter-in-law, Nicole visit us in NC a couple of times a year. This year they thought that it might be fun for the four of us to take a 2 1/2 hour road trip from our house to Charleston, SC. 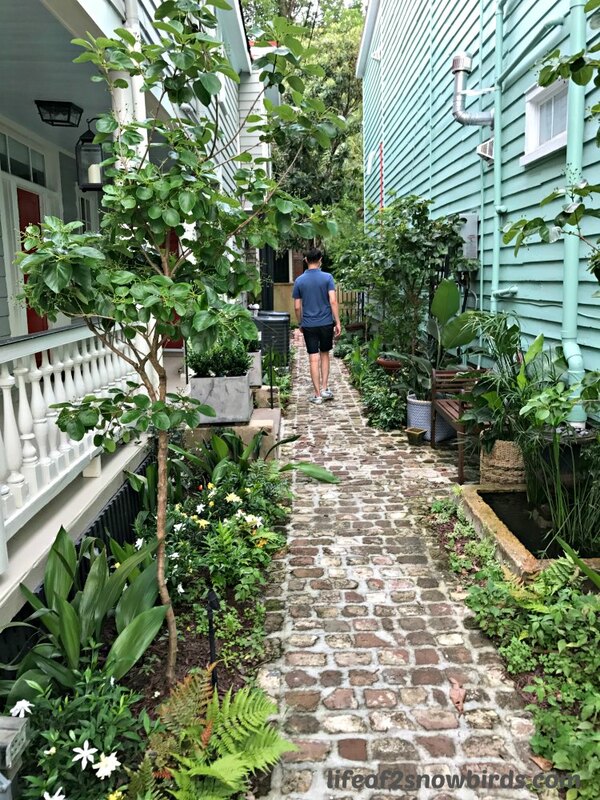 Joe made all the arrangements, including finding an incredible airbnb, It seems like only yesterday that it was my job to find things to do on vacation and I have to say being the follower instead of the leader is so much easier! I have too much to say about my first experience with airbnb so I will tell you about it soon in a separate post. Here's one preview picture of where we stayed that I'd like to share though. 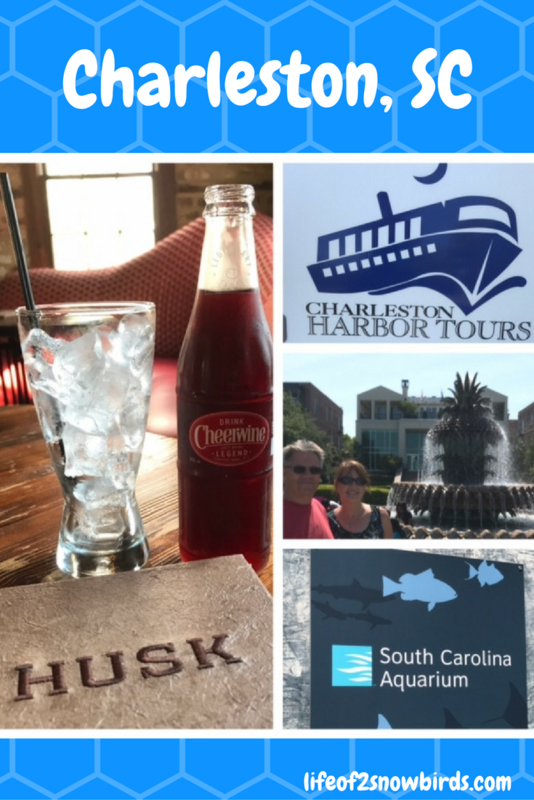 Day 1 - We arrived in Charleston at lunchtime and just had enough time for a quick bite because we had a lot to do and only two days to do it. 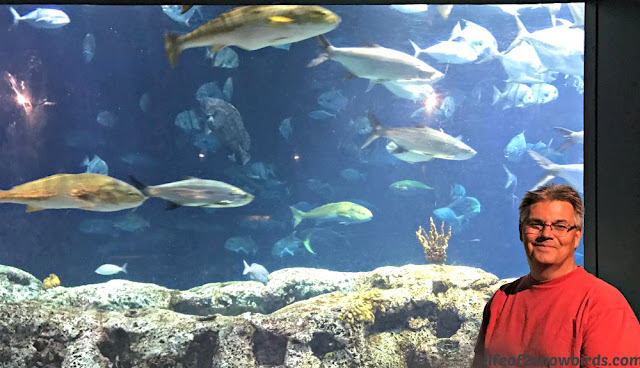 Our first stop was the South Carolina Aquarium. It's always fun to get a close up view of our beautiful underwater world. I had never seen an albino alligator before so that was pretty interesting. And I have never held a purple sea urchin before and I got to do that. I'm really surprised that I didn't scream and drop it when it moved, because I am weird like that, but it was so small that I barely felt his little feet as he walked off my hand. 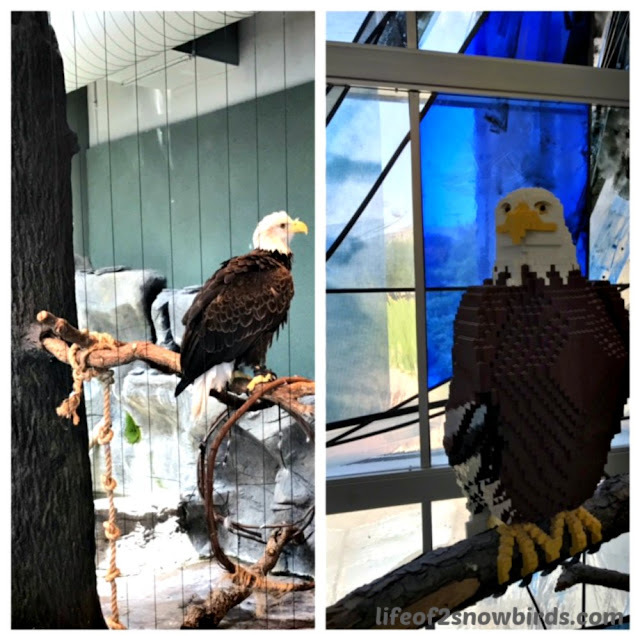 Can you tell the real eagle from the lego eagle? There were lego replicas of many of the fish and animals scattered around the aquarium. Each one more amazing that the next. 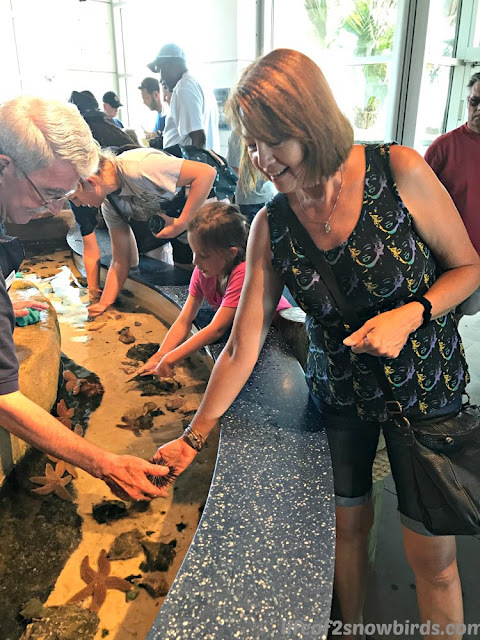 We all agreed that the South Carolina Aquarium was one of the best aquariums we have ever been to. 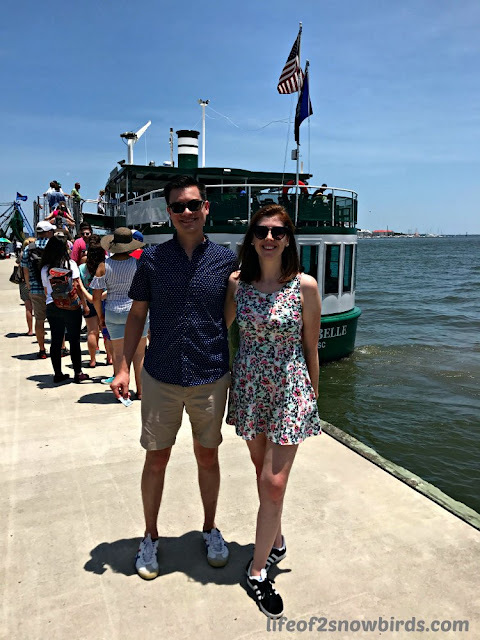 Now it was time to take a 5 minute walk to climb aboard the Carolina Belle for a 90 minute tour of Charleston Harbor. (We were able to buy a combo ticket that included these two attractions and saved $5.00 per person)! When we boarded the Carolina Belle we had a choice of either heading down into the air conditioned room or up to the outside level. As you can see, Nicole has the fairest skin of anyone I know and it doesn't take long for her to burn to a crisp in the sun! We chose to head towards the air conditioned room. It was very hot on this particular day so we were very thankful that the boat had ice cold drinks available for purchase. We settled in and off we went into the harbor. Me, Soko and Joe climbed the stairs to go outside for awhile. There were many sites to enjoy. 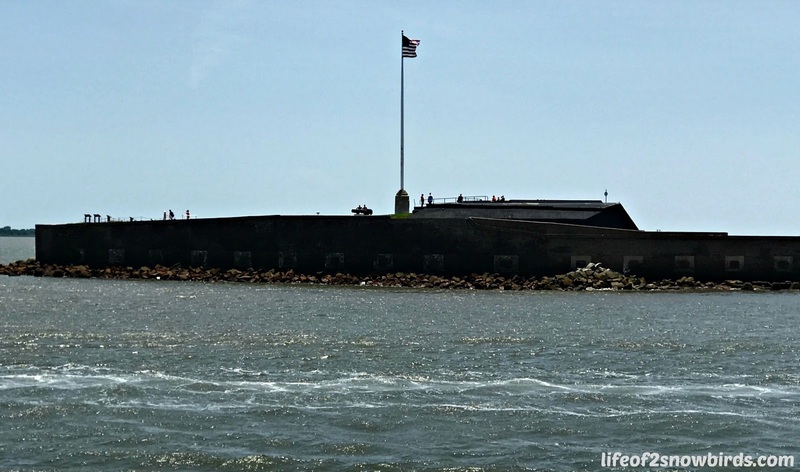 We especially liked getting a glimpse of Fort Sumter where the first shots of the Civil War were fired. One day we will get back to Charleston to take a tour of the fort. Another piece of history along the harbor is the USS Yorktown which is an aircraft carrier that was built and used in WWII. We also were in awe of the beautiful homes that lined the harbor. We learned from our narrator that Reese Witherspoon and Bill Murray are owners of a couple of those homes. The boat ride, aquarium and harbor were a good time. Now it was time to find the Pineapple Fountain! 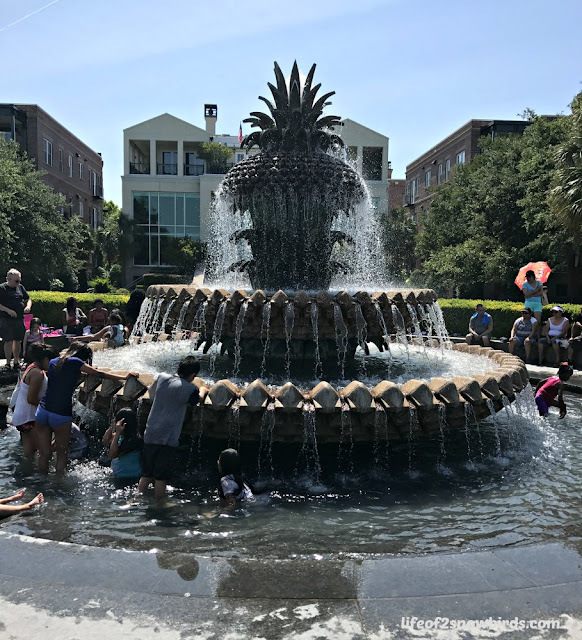 The Pineapple Fountain is a focal point in Waterfront Park. Waterfront Park is located along the Charleston Harbor in downtown Charleston. We didn't realize that we were able to splash around in the fountain so that was a nice surprise when we got there on a very hot day. From the park we were able to walk to Husk. The restaurant was not open, it was too early, but their bar which is in a building next to the restaurant, was. 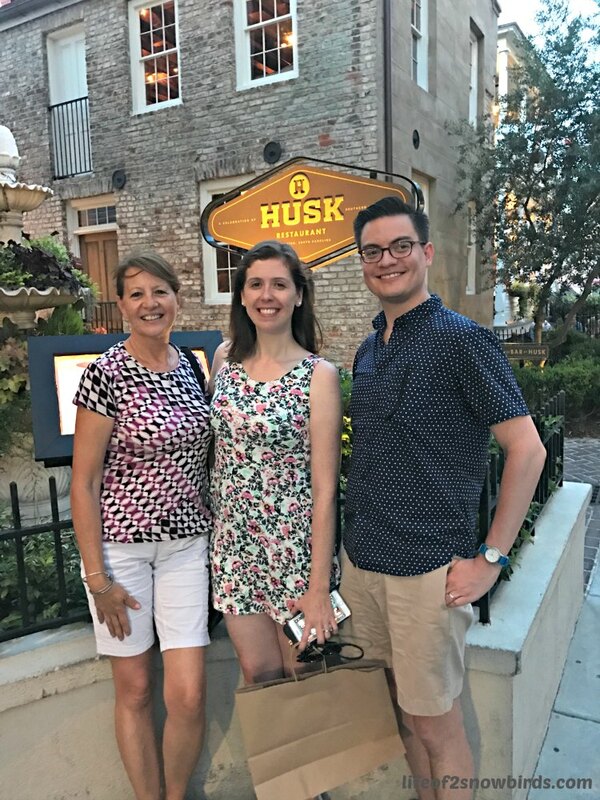 Joe was able to make lunch reservations at Husk for Day 2 of our stay here, but couldn't get dinner reservations for either of the days we were going to be in South Carolina. Having dinner at Husk was a big part of the reason why we were vacationing in Charleston. Joe and Nicole had first heard of the restaurant when it was featured, along with Chef Sean Brock,who runs the restaurant, on Anthony Bourdain's series, Parts Unknown. They liked the fact that the menu would change depending upon what the local businesses were supplying the kitchen with at any given moment. Also any food that comes into the restaurant has to come from the south so they were excited about enjoying some unique southern cooking. Joe had heard, and our waitress at the bar confirmed, that if you showed up to the restaurant by 5:15 you could possibly get a walk-in reservation. Joe and Soko headed next door to the restaurant at 5:00 while me and Nicole finished our drinks. There were three groups on line already when they got there but, thankfully, Joe was able to get us a 7:30 reservation! That gave us just enough time to check into our airbnb and run back out. Joe wanted to make sure we were near the restaurant asap because there was a chance he could be called earlier than 7:30. He was called at 6:30! 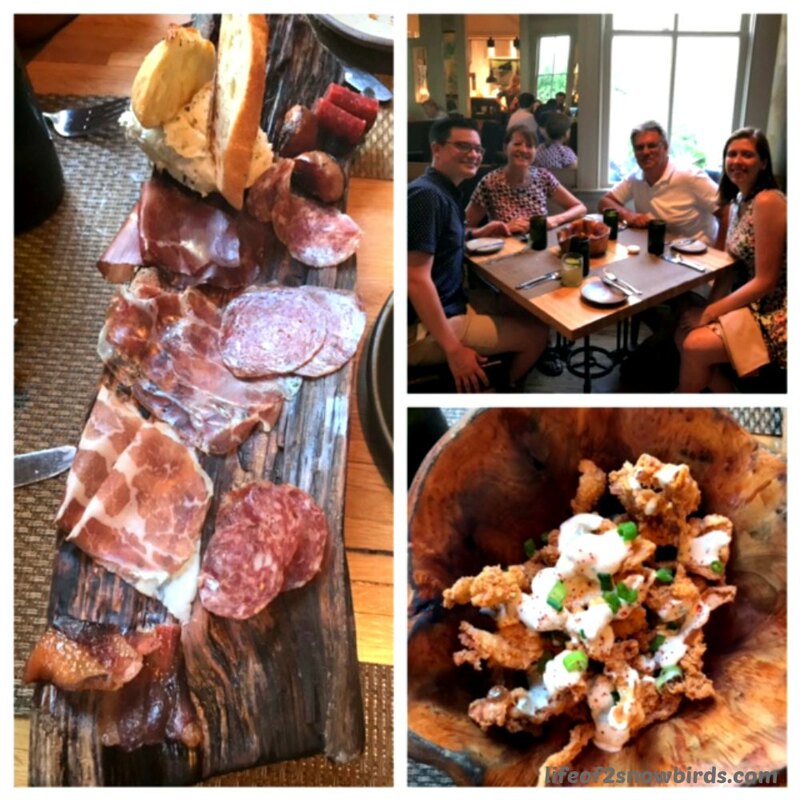 Joe had looked at the Husk menu beforehand on their website and decided he wanted us to try the Selection of House Made Meats if it was available and it was. The presentation of the meats on a log was very cool. We had fun comparing the different meats and giving our critiques about each one. I have to admit that the Whipped Beef Lardo was not my cup of tea, but I really enjoyed the Peppermash Salami. I took a look at the menu and saw Southern Fried Chicken Skins and thought we really had to have them. I think that the best part of the chicken is the skin and then to have them fried perfectly in an amazing batter and served with a delicious ranch dressing sounded (and tasted) like heaven to me. We each ordered our own entree but of course we had to try a bite of each others. Starting at the top left is Joe's entree Carolina Heritage Pork, Nicole's entree Mark's Wreckfish, my choice Confit Duck Leg and Soko's NC Chicken. The sides that came with the proteins were so well thought out and worked perfectly with the meats and fish in each of our dishes. We all agreed that we enjoyed Nicole's choice the most. None of us had ever heard of wreckfish, but we learned on the episode of Parts Unknown that Chef Brock will use fish most other restaurants won't. I described the wreckfish as having the right amount of fishyness (which is not even a word!). It was delicious! We all rated Husk five stars! But five stars usually means that if you are trying to be frugal this might not be the restaurant for you. 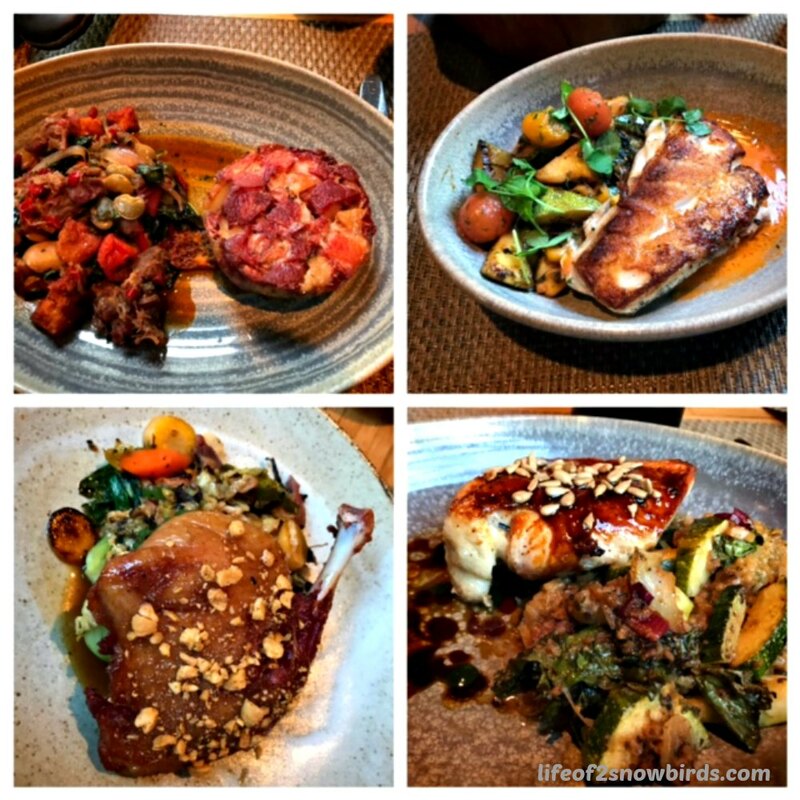 The entrees range from $30 - $34 so not too bad. If you do plan to indulge in one extravagant meal, though, as we did, during your vacation in Charleston, SC, I don't think you will be disappointed spending your money here. We had a long Day 1 in Charleston so it was time to relax at our airbnb. Look for our Day 2 in next Tuesday's post where I'll tell you all about the unexpected special event we were treated to! Another place that I would love to go. Thanks for sharing and have a wonderful week. Hope you get a chance to go. i think you will have a great time! Looks like a fun trip! I enjoyed the pictures and following along. Love the pineapple fountain!! Thanks so much for sharing with us this week at Brag About It! It was so much fun. I need to go back. Thank you for having me at your party! Thanks for sharing at Brag About It. I was delighted to see this post. I live in Charleston and I always enjoy reading about experiences of visitors here. I agree with you about the aquarium-it's a great one. I loved visiting your area. I definitely want to go back. Yes. The aquarium was one of the highlights. I love visiting Charleston also! It sounds and looks like your trip was a lot of fun. I am looking forward to reading about Day 2! Thanks for sharing at Celebrate It! It's a great place to visit isn't it? So charming! Thank you so much for having me! Thank you for your very nice comment and for having me at your parties! Thanks for the tour. I read part 2 as well. I've always thought it would be cool to try restaurants that have been reviewed by Anthony Bourdain. My son often plans vacations around restaurants they want to try! You would love the lego displays at the aquarium if you appreciate lego creations. Hope you get a chance to go! Brilliant timing with this post. I am tucking it away. We will be in Charleston in a couple of weeks. Wow! That is good timing! Hope you have a great time in Charleston! Great entry! Wonderful shots of your adventures there. Thank you so much and thank you for a great party! I hope you get a chance to go. I think you would enjoy it! You were very fortunate to live so close to such a special place to enjoy your weekends. Thanks for hosting your wonderful party. I love looking at everyone's posts. Charleston looks fabulous! It has been on my list quite awhile but you have convinced me to go sooner than later. I particularly love your charcuterie plate there - oh yum. Thanks for coming to Fly Away Friday! See you this week! I hope you get a chance to go and ,yes, the food was amazing!